The Western has left an indelible mark on the world. Thanks to Hollywood, virtually everyone knows the ingredients of the Western--the lassos and the Colt .45s; the long-horned steers and the hanging trees; the stagecoaches and the Stetson hats; the outlaws and the lawmen; the gamblers and the gunfighters. And virtually everyone knows the settings of the Western--the red rock monoliths of Monument Valley; the jagged, snow-capped peaks of the Teton Range; the treeless expanses of the prairie. The iconography of the Western is the largest and richest of all the film genres, and Hollywood has burned it into the minds of moviegoers from Dodge City to Timbuktu. Part of the allure of the Western was its very simplicity. 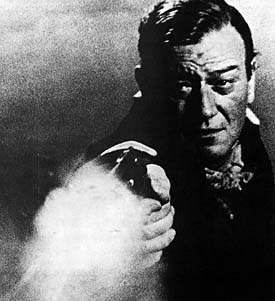 As critic Richard Schickel said, because "everyone wore a six-shooter, complex moral conflicts could be plausibly resolved in clear, clean violent action" (BFI, pg. 11). This decisiveness allowed the West to take on mythical dimensions, to become a place where great legends could be born. These myths and legends were embodied by Western heroes such as Wyatt Earp, Doc Holliday, Wild Bill Hickok, Buffalo Bill Cody, Calamity Jane, Jesse James, and Billy the Kid. Equally important, especially in the first half of the 20th Century, was the immediacy of the American West. When Hollywood first set up shop, the last great frontier was so close at hand that gunslingers/lawmen like Wyatt Earp drifted to Hollywood to serve as consultants on movie sets. This closeness to the West made the Western myths tangible and all the more powerful. At the heart of the Western, and not to be underestimated, was physical action--runaway stagecoaches, Indian raids, bank holdups, posse pursuits, and cattle stampedes. The Western resolved its conflicts through violent brawls and gunplay, reestablishing the moral order with an exhilarating BANG! during the final reel. 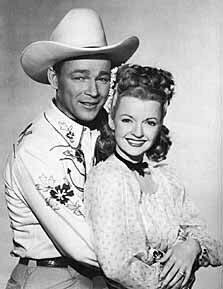 Roy Rogers and Dale Evans. Hollywood sold its stories about the West to an eager American public, providing us with a wide range of Westerns, from the series Westerns of Gene Autry and Roy Rogers with their clean-cut stars, fun-loving sidekicks, and guitar strumming singalongs to the obsessed, revenge bent heroes of Anthony Mann's majestic '50s Westerns. The Western provided infinite variety on a relatively small stable of situations and plots, with conflicts often growing out of several archetypal situations: ranchers vs. farmers (Shane and Man Without a Star), Indians vs. settlers (The Searchers and Hondo), and outlaws vs. civilization (My Darling Clementine and High Noon). Robert Warshow in his influential essay "Movie Chronicle: The Westerner" described the Western as "an art form for connoisseurs, where the spectator derives his pleasure from the appreciation of minor variations within the working out of a pre-established order" (Warshow, pg. 66). Many filmmakers felt at ease with the Western and made their best movies within the genre. In a short speech before the Director's Guild, director John Ford (who had directed movies from many different genres) went on record as saying, "My name's John Ford. I make Westerns." Directors such as Ford, Budd Boetticher, Anthony Mann, and Sam Peckinpah excelled at prying unsuspected complexities and ironies out of the well-worn stories of the American West. As a result, in John Ford's The Searchers we have much more than a simple quest to find a young girl kidnapped by Indians; we have the story of a quest that will never end, for the story's hero, Ethan Edwards (John Wayne), can never become part of the civilization he strives to restore. And in Anthony Mann's The Naked Spur, we have much more than the simple story of a bounty hunter (Jimmy Stewart) bringing home a body; we have a story where vengeance and self-destruction are intertwined. "He's not a man. He's a sack of money." John Wayne in The Horse Soldiers. Some actors became closely identified with the Western, including Tom Mix, W.S. Hart, Roy Rogers, Gene Autry, and Audie Murphy--but for many people, no one epitomized the Western like John Wayne. With a towering stature and a steely gaze, Wayne dominated his movies like a national monument dominates the land. His image has worked its way into the American consciousness as a metaphor for America itself, its strength, its determination, and its reliability. A quick survey of his movies--from Stagecoach to The Man Who Shot Liberty Valance--is very nearly a list of the greatest Westerns ever made. While Wayne owns the top echelon by himself, a host of other actors have made powerful contributions to the genre, including Henry Fonda, James Stewart, Gary Cooper, Joel McCrea, Randolph Scott, and Clint Eastwood. Hollywood fed us a steady diet of Western myths, legends, and heroes for over five decades. And in the process, the Western myth engulfed American popular culture--from clothes (denim jackets, jeans, and cowboy boots) to children's toys (cap guns, rubber-tipped arrows, and tom toms). Its lexicon entered our language ("round up," "hog-tied" and "bury the hatchet"). The Western held our interest (with only minor lapses) until post-war cynicism ate away at the American psyche and we started doubting the heroes of the West. Gradually then the West began to fade away, struggling in spasms of violence in The Wild Bunch and the Spaghetti Westerns of Italy, until the Western hardly seemed relevant anymore. And not until the '90s arrived (with films such as Dances With Wolves and Unforgiven) did it seem possible that the Western could survive in any form other than dewy-eyed nostalgia.